Fluorescent and compact fluorescent lighting in one convenient unit. * Independent rocker switches operate the lights independently or together. 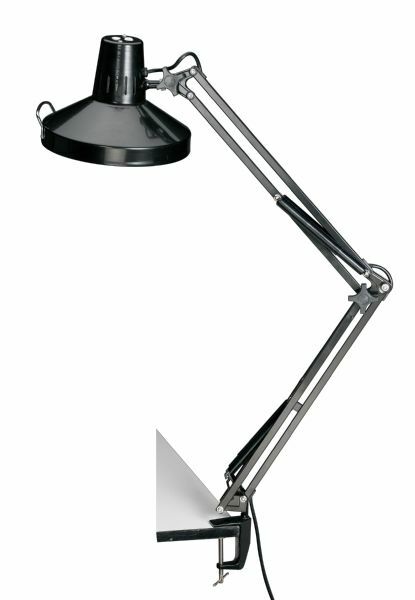 * Spring-balanced swing-arm features spring covers and a generous 45" reach. * Large comfortable thumb knobs make it easy to adjust the arm and shade angle. * The 10" diameter heavy-duty metal shade has a stay cool handle for easy positioning. * All-metal construction with 3-prong grounded power cord electronic ballast and heavy-duty adjustable metal mounting clamp. * Uses one energy-saving T5 28w circular fluorescent bulb (included) and one compact fluorescent bulb up to 23 to 25w CFL equivalent to 100w incandescent bulb (not included). The wattage is 26-75w, 8-25w.